Bidwells is a property consultancy founded in 1839. Their long history is a mixed blessing, with some competitors portraying Bidwells as stuck in the past and out-of-touch. We were tasked with creating an advertisement for an extremely niche role – a Rural Diversification and Development Surveyor – that would appeal to people who previously thought of Bidwells as staid and dull, whether potential applicant or potential client. We knew there were very few people qualified to do this role and we recognised that this was a great opportunity to ‘make some noise’ in the market and help change the industry’s perception of Bidwells. The client was also onboard and keen to show they had both a sense of humour and understanding of how they were viewed. The chosen concept played on both the misperception of the company and the style of the magazine in which the advertisement appeared – Land and Business magazine (advertisements for clay-pigeon shoots, articles on wildlife etc). The double page spread, running in the display pages, was designed in the style of an old bird-spotting handbook – “The Bidwells Book of Rare Species” with the copy following the same theme and focusing on the “extreme rarity” of this particular species of Surveyor. 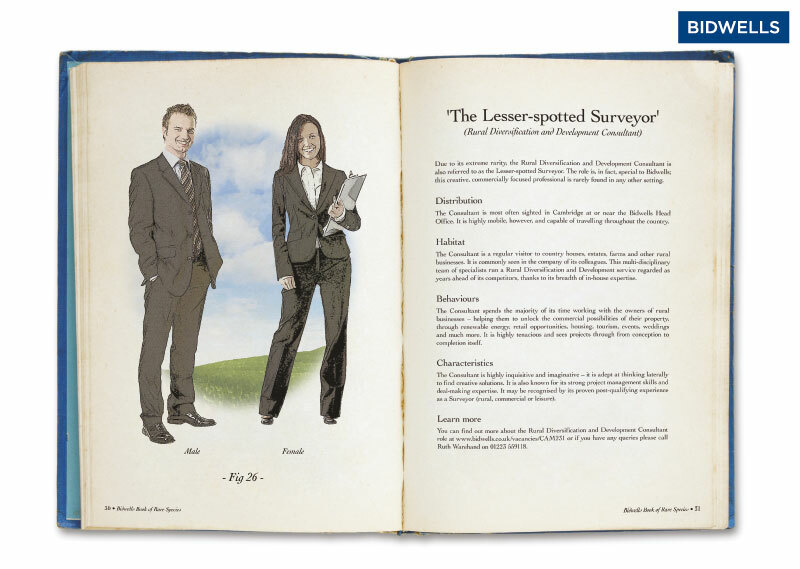 Photographic images of two young professionals in modern suits (not a wellie or Barbour in sight) were treated to look like hand drawn illustrations and the advertisement was set within a yellowing old book. The traditional measure of success absolutely applied here – this niche campaign for a scarce professional delivered a number of relevant applications. Bidwells successfully appointed. It also garnered great praise from both existing employees and external competitors who were surprised and impressed by Bidwell’s creativity and humour in tackling this challenging project.